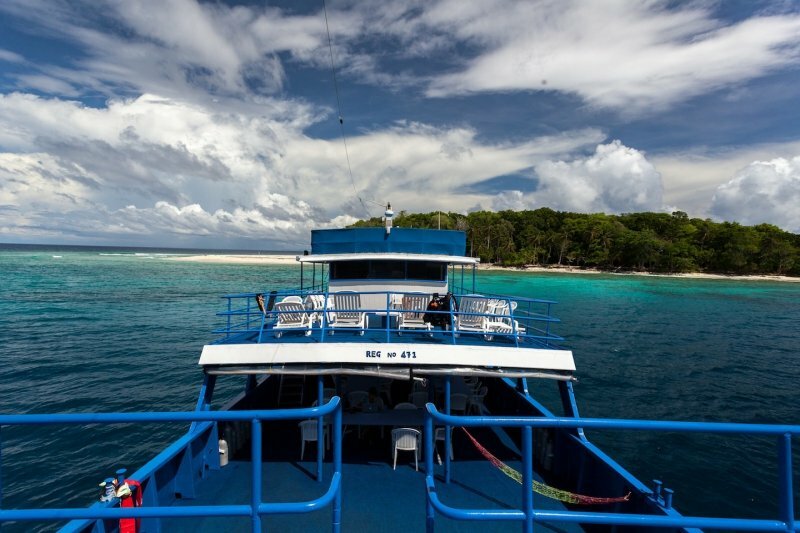 The Solomon Islands have a little bit of everything - wrecks, pristine reefs, large animals, macro critters, caves. This hidden gem sees far fewer tourists than other parts of the South Pacific. The Solomon Island waters are very nutrient-rich, and they support the entire food chain from microscopic creatures to major predators. 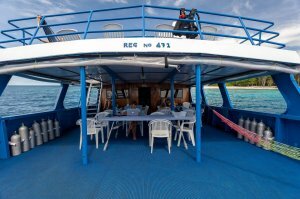 You will have a good opportunity to see a variety of sharks, mantas, dolphins, and turtles, and barracuda in uncountable numbers. In shallower waters, you will see cuttlefish, octopus, schooling lionfish, and amazing numbers and varieties of anemonefish, not to mention amazing varieties of anemones. Underwater terrain varies from walls to reefs, to passages to "bommies". You will visit caverns with shafts of sunlight illuminating the interior. You will swim 200 feet into a split in an island, and when you surface you will be under a jungle canopy listening to the parrots and cockatoos. In the shallows around almost every island, you will find channels, cracks, and fissures stocked with an unbelievable variety of shells, fish, plants, and corals that you could explore for hours. Who should go? : The experienced diver looking for the most pristine reefs that have a little bit of everything. A diver with a sense of adventure and is looking to explore the world. A diver that is checking off their dive travel bucket list. A diver interested in diving one of the healthiest marine environments in the world. Where is it? 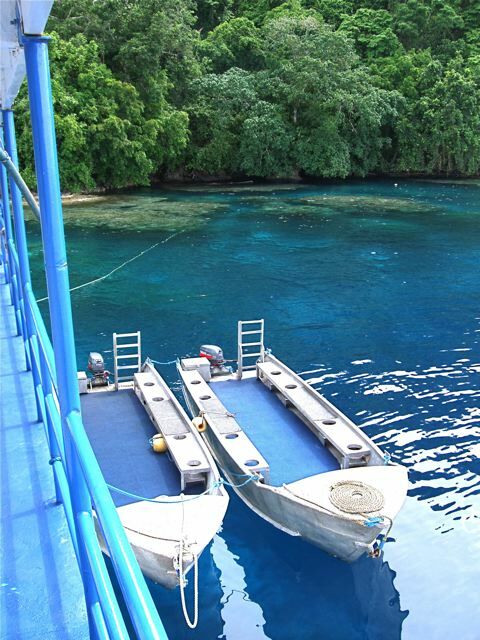 : The Bilikiki is located in the Solomon Islands that are a remote archipelago chain located in the South Pacific. They are located northeast of Australia. Click here for a map of the route and click here for a description of dive sites. *VISA and MC are accepted on board and are subject to the exchange rate of the day. Foreign transaction fees may occur depending upon your credit or bank card. A non-refundable 50% deposit of $2925 with the balance due March 1st, 2019. To be paid only by check or money order. If you would like to pay with a credit card an additional 2% will be added. *Additional tax @ $25 per person per day ($250) included in price. 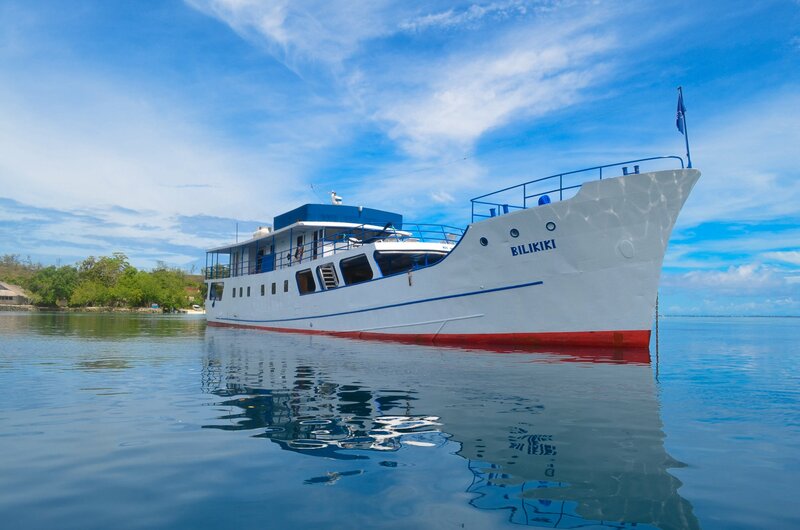 MV Bilikiki is among the great live-aboard dive boats of the world. 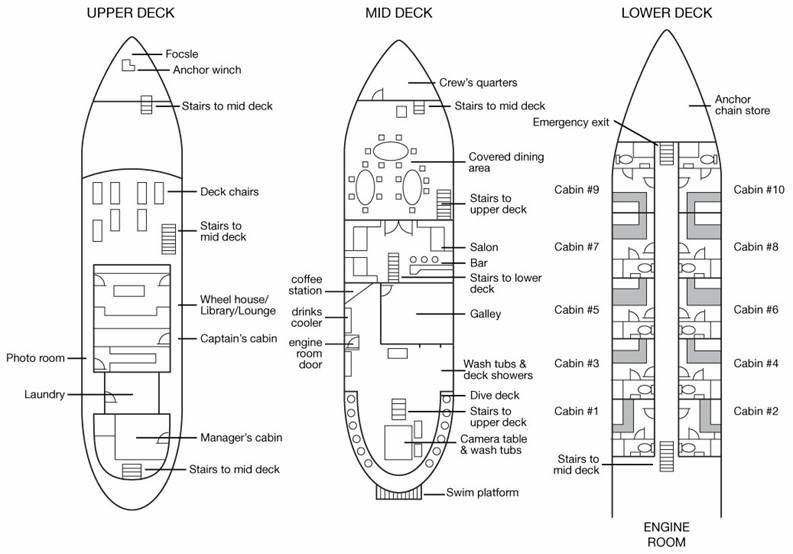 At 125ft long and 24ft wide - she is wide and seaworthy and offers unparalleled comfort at sea. 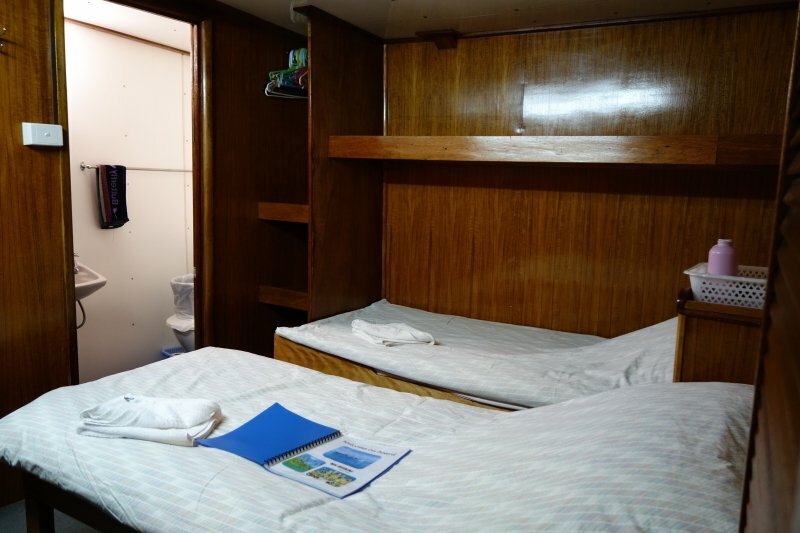 Passengers are accommodated in air-con cabins and staterooms. 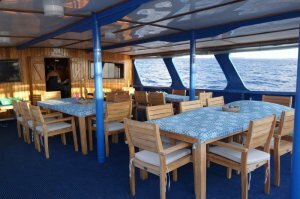 There is a large sun deck as well as open covered decks. The lounge areas are comfrotably furnished and feature large tables, a bar, multi-format TV/DVD and an extensive library of reference material and recreational reading. 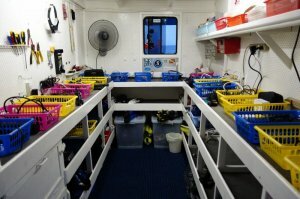 Bilikiki carries a crew of 11, plus two managers who are responsible for diving and ships operations. 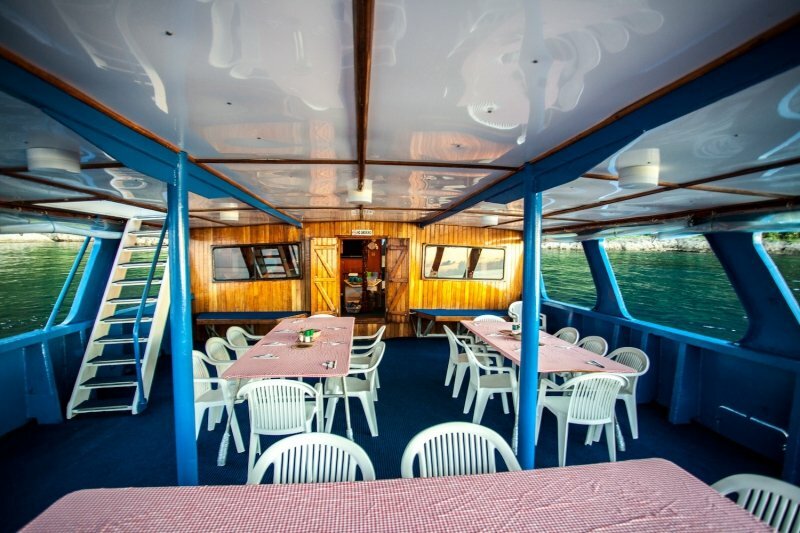 The crew are well-trained, friendly, attentive and professional. Click here for a layout of the vessel. 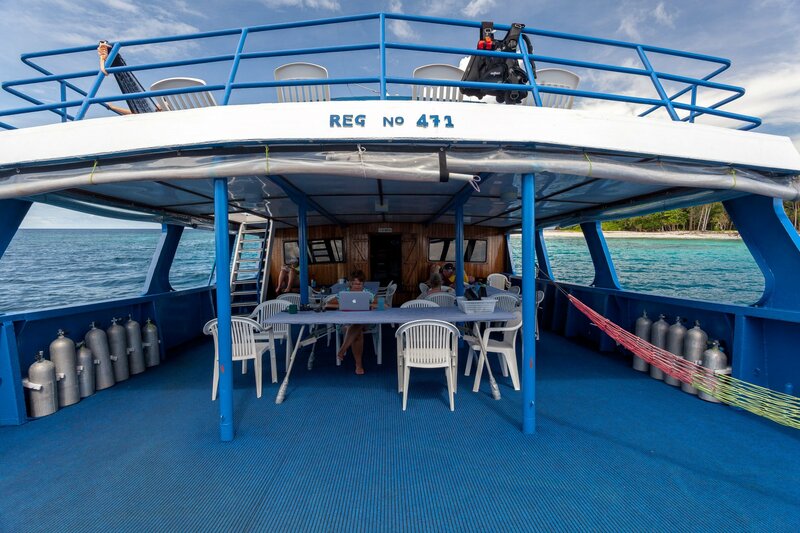 Meals are always important when you are traveling and diving, so the galley staff do their best to produce quality and tasty meals and snacks. Three hearty meals are served buffet style daily, and between meals the snacks are always ample. 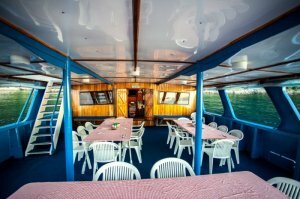 The menu will usually include a selection from fresh and cooked vegetables, meat, fish, chick, pasta, rice, bread or toast, scones, biscuits and of course, tea, coffee, hot chocolate, and all the usual condiments to complete the meal. Occasionally pizza will be on the menu and desserts may be cakes, pie or puddings. There is always lots of fresh fruit and fresh lime juice to quench your thirst. 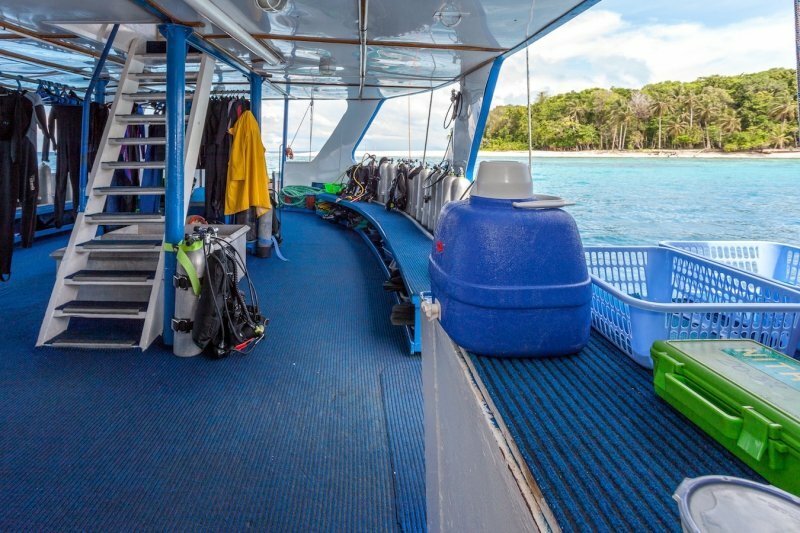 The Bilikiki has large dive decks that offer individual storage for gear, racks and hangers for suits, fresh water showers, separate rinse tanks for photo gear, and easy access to the skiffs. Tanks are filled at the end of each dive then rigged for the next one. Bilikiki crew are trained to expertly handle your tanks and other gear. The only time you have to touch your tank is when you're diving and it's on your back. Diving is done mothership fashion with divers shuttled to the dive sites in one of the two specially designed aluminum skiffs (called "tinnies"). Once in the water, the divers are tracked by their bubbles and can be picked up by the tinnie crew and shuttled back to the ship almost the minute they reach the surface. This eliminates long swims, current fighting and sitting in the hot sun while waiting for other dives to surface. 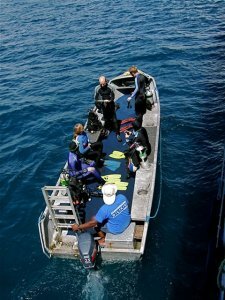 A briefing will precede each dive, and the dive masters will outline the type of dive, what you can expect to see and recommendations regarding current, depth, and activities. 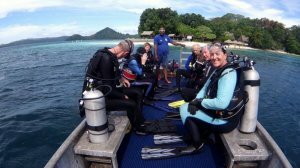 Divers set their own profile in conjunction with their buddy, their computer, and their previous diving activities, and are welcome to discuss their plans for assistance and advice. A visitor's permit will be issued for nationals of the United States, most Commonwealth and most European nations on arrival. Anti-malarial medication is recommended and travelers should ensure other shots and vaccinations are up-to-date. Travelers should consult their doctor or local health unit about immunizations, vaccinations and oral preventatives for hepatitis A, malaria, polio, tetanus, typhoid. There are numerous malarial prophylactics. At the moment Dozycycline is popular and effective against malaria. It is also an antibiotic and therefore offers some protection from coral cuts and other scrapes. Malarone is also widely used and has very few side effects. Be sure to check with your doctor for their recommendations. The only one we ask you to avoid is Mefloquine (brand name Lariam). It's side effects can mimic decompression sickness. We recommend arriving in Honiara the day of the cruise and depart on the same date that it is finished; however, we can also assist with extensions to stay at some of the lovely resort islands in the Solomons. 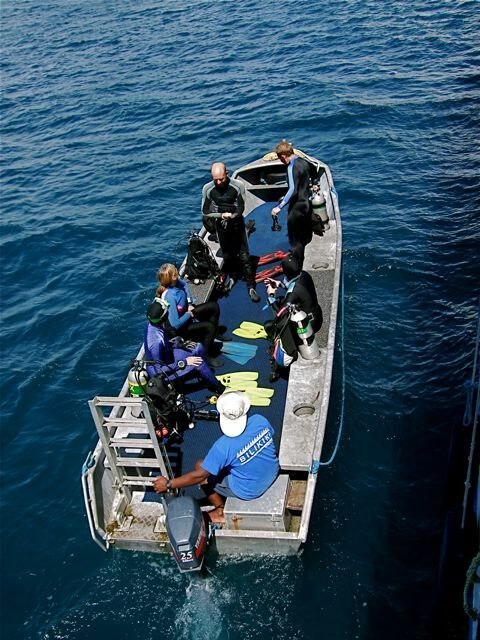 Divers in the Solomons are usually comfortable in a Lycra or 2-3mm wetsuit. Water temp will be between 82-85 degrees, but after multiple dives per day, you may find that you need more protection - a sharkskin or hooded vest. Viz will range from 75 to 125 feet, with occasional sites with much better viz, and yes, you will have dives with viz less than 75 ft. The Solomon Island waters are very nutrient rich. They support the entire food chain from microscopic creature to major predators. Because of this, viz may be less than that of some other world famous dives sites, but for this same reason, you will find a multitude of large and small critters to observe and photograph. In some cases viz may only be 10 or 15 feet, because of all the fish blocking your view! Bring both macro and wide-angle lenses for your cameras. The Solomons are a photographers paradise, so equip yourself accordingly. It is also recommended you bring your laptop so that you can view and edit your images. 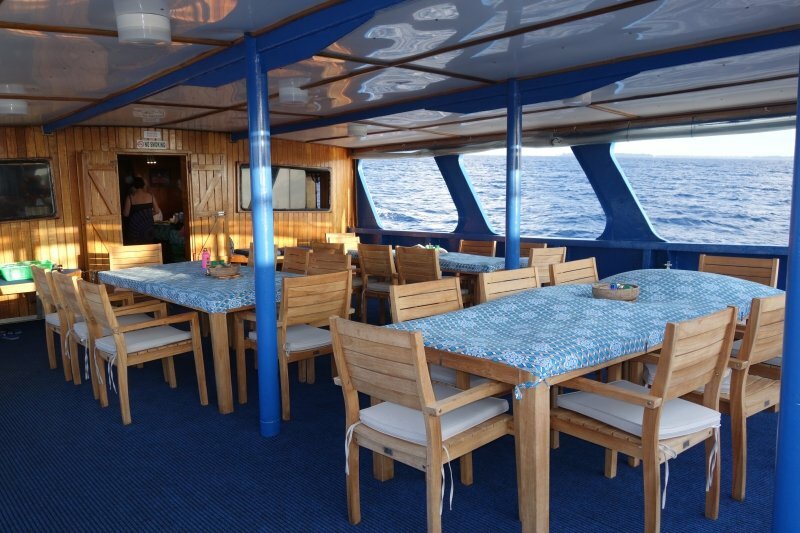 Bilikiki is fitted with 110-volt electrical outlets for battery recharging and has large camera tables for checking equipment, as well as, digital projector and widescreen LCD TV with USB, HDMI & VGA inputs. The currency used in Solomon Islands is the Solomon Island dollar, and this is what is required for shopping around town, and for purchasing carvings and other handicrafts from villages while on Bilikiki. Currency from other countries can be exchanged at the airport, from any of the banks in town or to a limited degree on board our vessels, from the dive masters. 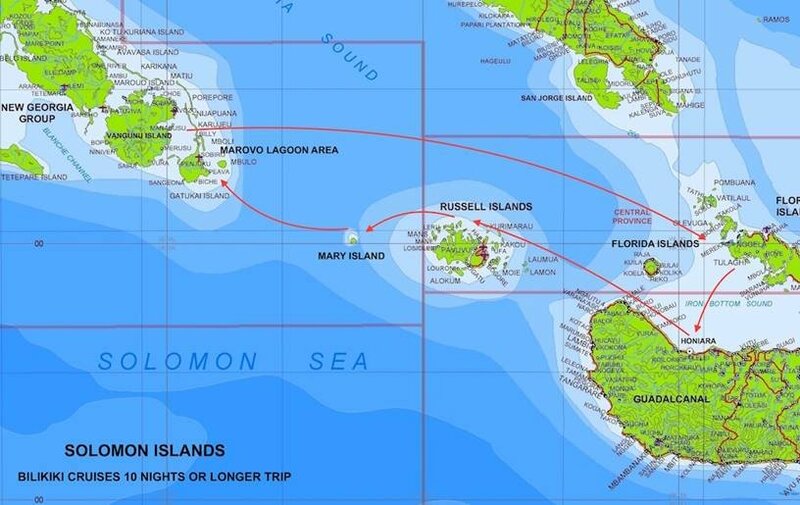 The Solomon Islands is in a remote part of the world. The nearest recompression chamber is about 1,500 miles away in Townsville, Australia. You will be doing a lot of diving, probably four or five dives per day, and that adds up to a lot of nitrogen. Pace yourself, and consider sitting out a dive every now and then. Again, DAN or Dive Assure is REQUIRED. Smart divers do not dive without it. 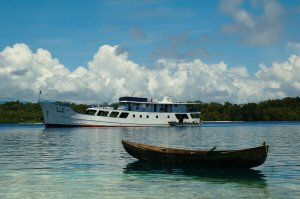 You will be traveling in and among the islands during your stay and you will have many opportunities to meet the Solomon Island people. Solomon Islanders are a proud and friendly group who have been making passengers aboard the Bilikiki welcome since the first trips in 1988. You will be invited to visit their villages, schools, and churches and they will be very pleased to display, and sell, their carvings, baskets and other goods. Ship managers regularly purchase fresh fruit and vegetables from the villagers and their canoes of produce make regular appearances when we are near villages. While anchored off their villages the ship will be visited by these very skillful sailors in their dugout canoes. The boating and swimming ability of the children is quite remarkable and very entertaining. Solomon Island lifestyle remains very traditional, with a smattering of western influence. Village houses are still built of palm leaf intricately woven to shelter the occupants, although some corrugated iron is used for building. Villages are usually clean and neat with clearly defined paths among the buildings. Please remember that these are private homes and visitors should never enter or look into individual houses without permissions. The Solomon Islanders raise crops in their market gardens near the villages and also raise chickens and pigs for food. Fish is also an essential part of their diet, and often when the ship is anchored off a village for the night, the village men and boys will come out to catch the fish that are attracted by the ship's lights. 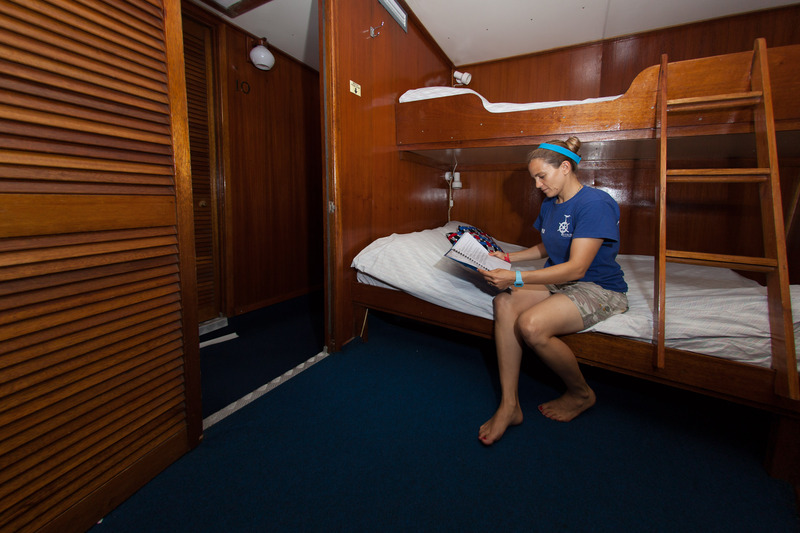 Power throughout the ship is 240 V 50 cycle, using Australia style 3-prong outlets. There are also plenty of American style 110 V 60 cycle outlets for charging cameras, strobes, dive lights, etc. These outlets are only for charging purposes so if you intend to use hairdryers (who needs a hairdryer? ), shavers, etc you will need to bring adapters. While tipping is not common in the South Pacific, it is an accepted practice among live-aboard operations and others offering service to North American and European clientele. If you believe service you have received warrants it, a gratuity to be shared among all the crew should be given to one of the managers at the end of the trip. 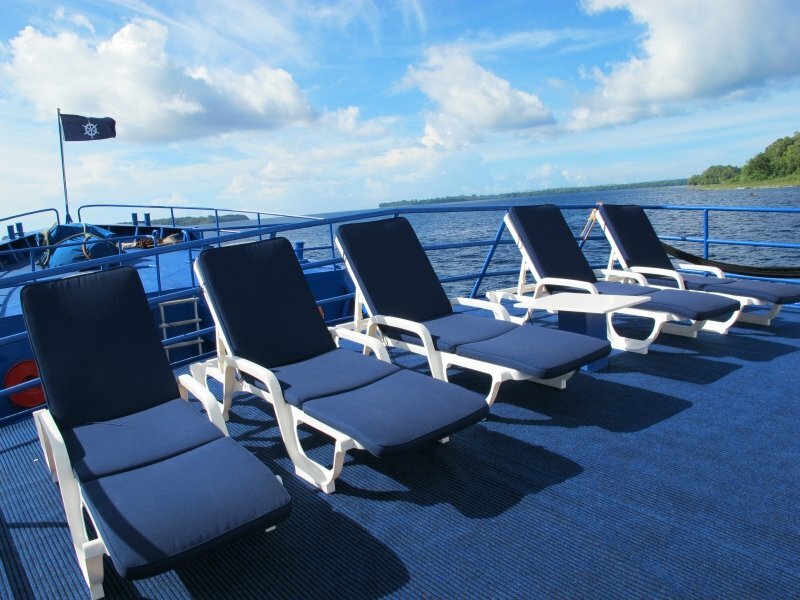 T-shirts, shorts, and bathing suits are suitable on-board attire, with a light windbreaker or sweatshirt for the odd cool or breezy morning, or after your evening dive. On island excursions, T-shirts and walking shorts are generally acceptable, but ladies should be sensitive to local customs, and not wear bathing suits or abbreviated shorts or other brief clothing ashore. Travel light - no need for a different outfit each day. The Bilikiki is well maitained and carries all necessary navigation and communication equipment. The ships maintain regular radio contact wiht the office in Honiara, and limited message capabilities, for emergency or urgent communications, can be made available. The Solomon Islands is a remote area but cell phone coverage is increasing in the islands and in a few areas coverage is now provided by Solomon Telekom and Bemobile. Check with your provider or you could purchase a local sim card on arrival which normally provides (very slow) internet access on mobile devices. Otherwise, internet access is no available on board the ship. There is a satellite phone available for outgoing calls, and calls are charged by the minute. In case of emergency have your family or friends contact our office in Honiara. Please keep incoming messages brief as they will need to be transcribed and read out over the radio. If you wish to reply you may then make an outgoing call via satellite phone.